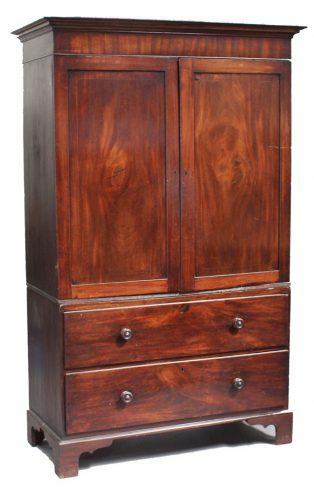 Beautiful Early-19th Century linen press, made from Cuba mahogany. The sides are made of mahogany painted redwood. The topshelfs are very solid, therefore also suitable for your christal glassware and china. The bottom of the cabinet consists of two deep drawers. Very convenient for your antique table linen, napkins, cutlery and candles. Everything you need for a romantic diner by candlelight!